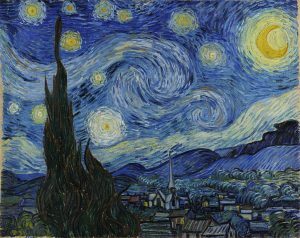 What is the connection between Art and Fancy Color diamonds? Passion and Color! When we look at various artworks at museums, we see images, we see stories, love and color; We see passion. We get to that point only after viewing and in fact staring onto works of art for hours on end. At first there is nothing, then we start feeling something, and then we get to a passionate level. It is the exact same thing with Fancy Color Diamonds. Some of you may agree and some may disagree even faster. How can we look at a fancy color diamonds and feel the same way we do about art? Simple, keep on staring. Look at every facet, at every inclusion. Each of them has a story to tell. Each goes back billions of years into the earth’s core, the earth’s heart. When we look at a rough diamond, all we see is a dirty stone, that we may not even pay attention to if found on the street or on the beach. As the polisher examines the outer layer of a diamond, he creates a story, a works of art, in his mind. He then creates a “window” and looks inside the diamond. Further exploration is done. Connecting the dots, bringing the light into the diamond; Life begins. Every Fancy Color diamond has its polisher’s name written all over it! When it comes to colorless diamonds, the objective is purely yield. What is the largest that can be polished out of a rough? How many different diamonds can be cut to maximise the financial value out of that rough? In Fancy Color diamonds, it is all about the color. How can we yield the best color possible? That is where Art, Passion and Patience meet. The main objective and goal is color. How can we get the best possible color? This is where physics also comes into play. Polishing facets in different angles can make light come into the diamond, and either leave or stay in. That will affect the color. In Fancy Color diamonds, we want more color. I have been tracking the outcome of auction results for many years now, and have gathered over 20 years of information, on pink, blue, red and green diamonds. I broke them down into weight groups as well as intensity levels (pink and blue diamonds). Before and after each auction I analyse pure numbers, any new records, anything extraordinary things, and then report them to investors. It is obvious that I leave many details out so that I may help investors as much as possible have an edge over others. Now it is time to share some of those details (after the fact), I was inspired to do so by a recent project I took on (for which at the moment I cannot disclose any details). I always mention new records broken at auction. Sometimes those new records are extraordinary, and so we ask ourselves, what is really going on? over the last 20-30 years, prices for blue and pink diamonds have been rising steadily, but once in a while we see an “out of the ordinary” price spikes for some specific sales, and then the trend continues as normal. What are exactly those extraordinary price spikes? abnormalities? If we see a steady trend for Fancy Intense Blue diamonds trend going upwards, and all of a sudden we see a substantial price abnormality for a specific diamond sale, and subsequent sales continue with the trend, how is that particular sale seen? 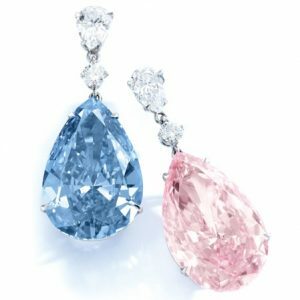 After the financial crisis of 2008, prices for unique Fancy Color diamonds such as pink and blue have started a strong uptrend because they are a great store of value, because they are real assets. 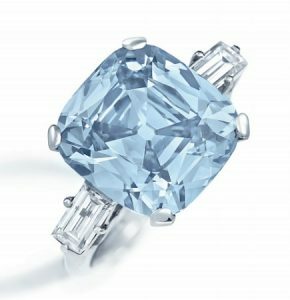 On April 4th, 2017 there was a 3.13 carat, Fancy Intense Blue diamond with an Internally Flawless clarity that was sold for $1.53 million a carat. Only 2 years earlier, on June 2, 2015, a 3.00 carat, Fancy Intense blue diamond, also with Internally Flawless clarity was sold for $851k per carat, almost half the price per carat. What was the difference? On April 18, 2018 we saw a 3.47 carat, Fancy Intense blue diamond with an I1 clarity selling for $1.92 million per carat. We all know that “I” clarity is really undesirable and really brings value down, so why did this diamond sell for so much? A further 25% more from the 3.13 carat sale, only a year earlier. The 3.13 carat, Fancy Intense Blue diamond with Internally Flawless clarity was sold on April 4th, 2017 at a Sotheby’s Hong Kong auction. It was lot # 1784. It was estimated to sell between $3.86 million and $5.15 million and ended up selling for $4.79 million or $1.53 million per carat. Even Sotheby’s was proud of the new world record and even marked it on the website. The GIA certificate mentioned by Sotheby’s is #10095242 and it was dated December 13, 2016, also as per Sotheby’s. If we go to GIA’s website and enter the certificate number for verification, the result will yield a new GIA certificate #6183440454* dated May 18, 2017, (about 6 weeks after it was sold at auction) with a new weight of 3.10 carats, also Internally Flawless clarity, but here is where the big BUT comes in, it is now graded as a Fancy Vivid Blue, and not Fancy Intense Blue as it was sold at auction. Why is that? 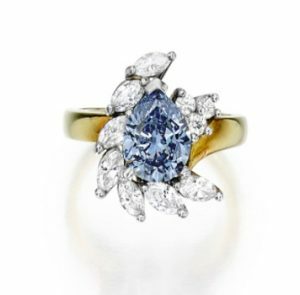 It was inspected during the viewing dates prior to auction, and it was assessed that if certain facets can be re-polished, and angles were played with, then that can affect the color depth, and in this case it was significant enough to get the diamond assessed as a Fancy Vivid Blue. All this with a loss of only 3 points or 1% sacrifice of the weight of the diamond. Let’s remember that every point is valued at $15,306 with a total loss of $45,919 and the cost for the polisher, the diamond was able to be upgraded to a Fancy Vivid Blue. So what about the new value? It was acquired for $1.53 million per carat, and in just six weeks, it was upgraded to a range of $2.2 million to $2.8 million a carat, a significant increase in value. All that remained was to find a new buyer for it. Let’s remember a few things that are extremely important: The color had to be already strong enough meaning it had to have a 10/10 color strength for an Intense Blue color, and then just minor polishing had to be done. All this was still a risk, and had to be done by a true professional dealer/polisher. The 3.47 carat, Fancy Intense Blue with I1 clarity was basically the same scenario. It was lot #138 at the Sotheby’s April 18, 2018 auction in New York. It was estimated between $2 million and $2.5 million and had a GIA certificate #1186953259 in its description. It ended up selling for $6.66 million or $1.92 million per carat. When we enter this certificate number into GIA website, it loads up a new certificate with the number 2193448437* dated august 31, 2018, 4 months after the acquisition. There were 2 major improvements done, both color grade and clarity. it was upgraded to a Fancy Vivid Blue and to a VVS1 clarity from an I1, which is a huge difference as well. The new weight was 3.13 carats. In this case, the loss of weight was 34 points or 0.34 carats, a huge 10%, which means that the loss of value was $666k overall, as well as the cost of the polisher. But the new value is between $2.3 million to $2.8 million per carat. Here too, the risk was huge in the case it was not successful. 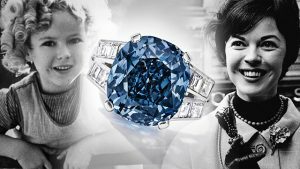 Not only a loss of money due to weight loss, but also overall value, as Fancy Intense Blue diamonds are selling in the $900k to $1 million area according to other auction results. 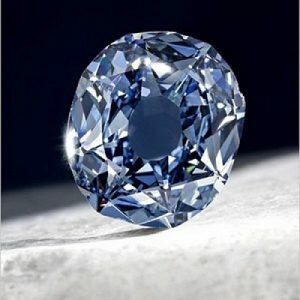 Let’s review another blue diamond, but larger. 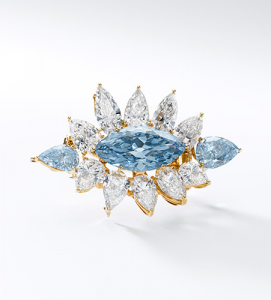 On may 17, 2016, again, at a Sotheby’s auction in Geneva, a Brooch by Alexandre Reza was sold. It had 3 Fancy Intense Blue Diamonds; 6.64 carat, SI1 and GIA # 5171528570, 2.01 carats, VVS2 and GIA # 2171529599, 1.01 carat, VS2 and GIA # 5172528581. It was estimated to sell between $9.8 million and $13.76 million. it ended up selling for $13.67 million. The average per carat sale was $1.415 million per carat, but we know that the value for a 6 carat is substantially more than 1 or 2 carat size. Back then we put the value of the 6.64 carat at $2.06 million per carat, a record for the 5-10 carat size. More than double the “trend” price sold at auction. When we entered each of the 3 original certificates into the GIA website, the results were: Certificate #5171528570, dated June 22, 2016 for a 6.24 carat, Fancy Vivid Blue diamond with a VS2 clarity, so both color upgrade as well as clarity, both significant, and only a month after the acquisition. The other 2 diamonds remained at the same weight and clarity, as well as color grade of Fancy Intense Blue. 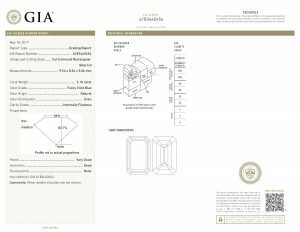 From this, we can determine that the acquisition objective was for the main diamond. The loss of 40 points or 0.40 carats, which is 6% cost about $824,000, but the value increase due to the color upgrade will be significantly higher. Rumours are that the current asking price on this diamond is $4.2 million per carat. Will it sell for that price? I highly doubt it, but even at $2.8 million to $3.5 million per carat, it would make a significant return on investment, even almost 3 years later. I guess by now you see a new trend….want more examples? sure, why not! 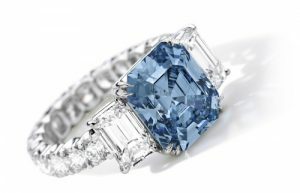 On December 5, 2017 at a Sotheby’s auction in New York, a 2.05 carat, Fancy Intense Blue diamond with Internally Flawless clarity was estimated to sell for $1 million to $1.5 million, which was within the trend of prices. It ended up selling for $2.655 million. 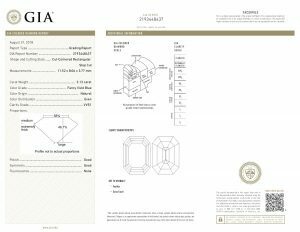 The GIA certificate was 2181676765, but when we enter it into GIA site, it shows a new certificate number 1196022308* dated January, 19, 2018 with the weight of 2.04 and a color upgrade to Fancy Vivid Blue. 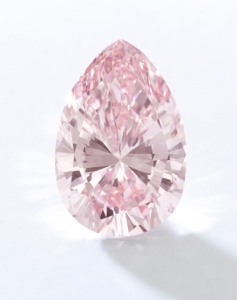 6 weeks after acquisition it was then valued at $1.6 million to $1.8 million per carat instead of $1.3 million and a loss of a single point on weight (approximate loss of $13,000). From the new Certificate we are also learning that it was probably acquired by David Morris in London. 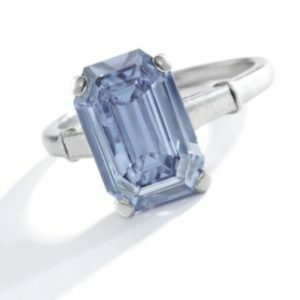 On May 17, 2017 at a Christie’s auction in Geneva, a 7.97 carat, Fancy intense Blue diamond with a VS1 clarity, was estimated to sell between $2.5 million to $3 million ( It was in Swiss Francs but I kept the same numbers). 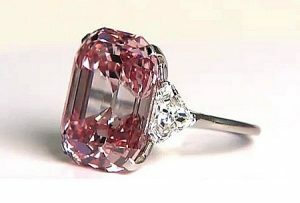 It ended up selling for $12.77 million or about $1.6 million per carat. 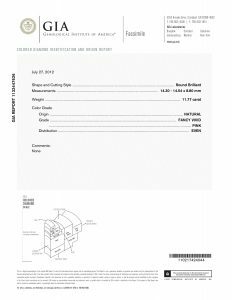 It had a GIA certificate # 6187159503. After entering it into GIA, it became certificate #2185532599* dated July 21, 2017 with the weight of 7.81 carat and a VS1 clarity as well as a color upgrade to Fancy Vivid Blue. This means that about 2 months after the acquisition, there was a loss of weight of 16 points or 0.16 carats which is about a $257k loss, but due to the color upgrade, it is now worth north of $2.8 million to $3.5 million per carat, not a bad deal. 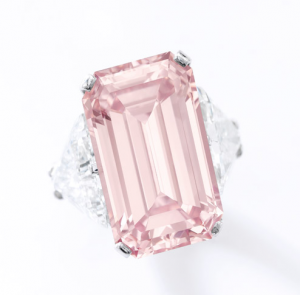 On May 29, 2012, at a Christie’s auction in Hong Kong, a 12.04 carat, Fancy Intense Pink diamond with a VS1 clarity, round brilliant by Harry Winston was sold for $1.45 million per carat. Its GIA certificate was #1132447626. When entering this number into GIA, we find that on July 27, 2012, only 2 months after the acquisition, the new weight is 11.77 carat, but was upgraded to a Fancy Vivid Pink diamond. At that time, this rarity would have probably sold north of $2.2 million per carat. 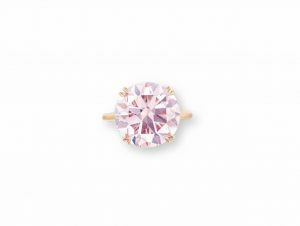 Graff’s two more recent and prominent acquisitions were the 17.07 carat, Fancy Intense Pink diamond with VVS1 clarity and the 13.20 carat, Fancy Intense Pink diamond with IF clarity. Both were acquired on November 17, 2017 at the Sotheby’s Geneva auction. The 17.07 carat was acquired for about $1.22 million per carat while the 13.20 was acquired for $1.23 million per carat. The GIA certificate for the 17.07 is #5172885524 and when we enter it into GIA we get the same certificate number but the weight is now 16.88 carat, Internally Flawless clarity. In my humble opinion it was probably sold to an asian buyer as the number 6 and 8 have significant meaning in Chinese numerology; so does 168, so 16.88 would be of greatly value for a wealthy asian individual. The GIA certificate for the 13.20 carat is #5171637362, and when entered into GIA website, the details remain the same, yet there are strong indications that Graff re-polished it into a Fancy Vivid Pink diamond, which means that its value has greatly increased. Another Successful Upgrade belongs to the Shirley Temple Blue Diamond. It was offered for sale during the April 19, 2016 auction in New York by Sotheby’s. It was a 9.54 carat, Fancy Deep Blue Diamond with a VVS2 clarity. the GIA certificate was 5171186027. it was valued at between $25 million and $35 million, but was not sold. The highest bid was $19 million. Sotheby’s mentioned that with a minor polish it can have an Internally Flawless clarity. It was done but remained a Fancy Deep Blue diamond. The art of Mastering Fancy Color Diamonds is the ability to spot a potential in improving the color, all in a natural way of optics and angles; To bring the diamond to its full potential. This can only be achieved by those that not only understand Fancy Color Diamonds, but that wake up in the morning, breath, eat and drink Fancy Color Diamonds and finally at night, dream about them. There are many investment opportunities that are available in the colourful world of Fancy Color Diamonds, but these opportunities come with a certain level of risk involved as well. The potential reward is not only financial but also the satisfaction of knowing that the potential in a unique Fancy Color Diamond was achieved. We can help you achieve these goals!